For Valentine's Day, here's a lighthearted look at the "relationship" between two complementary technologies: service virtualization and cloud dev/test labs. Hey, I know it's been a while since we started being "a thing." When we met, everyone said you were just mocking, and that I wasn't real enough to make a living, with my head in the clouds. Yet, here we are, a few years later. As a young Dev/Test Cloud, I always wanted to try new things. And what better use for Cloud than experimenting with software for startup companies? I was flexible, I thought I had the capacity to handle anything. I'd stay up all night studying or partying, but sometimes I'd crash. So what if some college kid's cloud-based photo-sharing site experiment goes down? It wasn't going to impact anyone's life. But when it came to serious business, there was always something missing. What was I going to make of myself? Who could trust their future to me, and develop things that really matter in the cloud? Clearly I didn't have everything I needed - I was lacking certain critical systems and data, and it was preventing me from maturing. But you came along and together, we changed all that. One thing I've learned is that I don't always have to handle everything by myself. A dev/test cloud environment is not just a place to store and run VMs for application work – it needs the same clustering, network settings, load balancers, security and domain/IP control as you have in production. I can handle a lot, for sure. But there are certain items developers and testers need that don't image so well. Like a secure data source that should be obscured due to HIPAA regulations, or a mainframe system the app needs to talk to, but would be unwieldy to represent in a Cloud like me. That's when I say Service Virtualization makes every day a great day. We've come a long way since then, and we've handled increasingly serious challenges. Simulating some very complex interaction models between systems, and deploying those into a robust cloud environment of real VMs and virtual services that can be copied, shared and stamped out at will across teams. We work together so well, we can practically finish each other's sentences. Hard to believe all this started less than 10 years ago. Here's to us, Dev/Test Cloud and Service Virtualization standing the test of time. Now let's go make some history together. Explore more writing and analysis from Jason and his team at https://skytap.com/blog/. 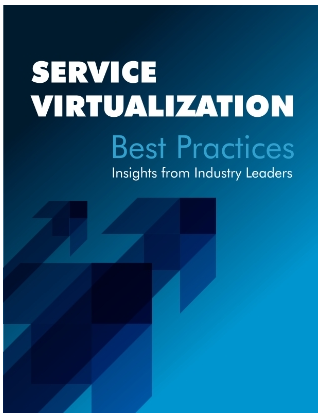 Download the complete Service Virtualization Best Practices: Insights from Industry Leaders guide in the Parasoft Service Virtualization resource center. Learn why leading companies love Service Virtualization. Cynthia Dunlop, Lead Content Strategist/Writer at Tricentis, writes about software testing and the SDLC—specializing in continuous testing, functional/API testing, DevOps, Agile, and service virtualization. She has written articles for publications including SD Times, Stickyminds, InfoQ, ComputerWorld, IEEE Computer, and Dr. Dobb's Journal. She also co-authored and ghostwritten several books on software development and testing for Wiley and Wiley-IEEE Press. Dunlop holds a BA from UCLA and an MA from Washington State University.